For someone who grew up with horror themed comics and trading cards as a kid, I was both wickedly excited and incredibly nostalgic when I received the 9th installment of Papercutz' Tales From The Crypt series. I'd read the 8th volume, which was the first in the series to introduce Diary of a Stinky Dead Kid - an instant favorite - and am thrilled to tell you all about the newest issue. Here's a little run down before I start gushing all over the place. 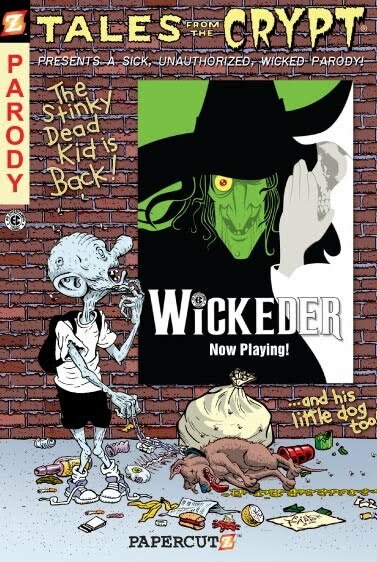 In the three stories, the original Crypt-Keeper offers his twisted take on all the countless manifestations of the Wizard of Oz, including the long-running Broadway musical in Wickeder, a chilling tale about an off-shore oil rig disaster entitled Kill, Baby, Kill! and to the delight of countless fans, the much requested return of The Stinky Dead Kid, Glugg and his little dog in Dead Dog Dies! I LOVE this series. I'm going to go further out there and tell you that I love everything that Papercutz is doing, but the parody stuff is by far my favorite. The stories are fast paced and fun, the characters are addictive, and the dialogue is hilarious. It's all in the vein of the old school, tongue-in-cheek, horror mags/comics that we all loved. As mentioned before, this volume features the return of The Stinky Dead Kid. A favorite among fans, TSDK is a great parody of the YA hit Diary of a Wimpy Kid - but geared towards those kids (young and old) who have an affinity for something darker, and potentially more insidious. Papercutz pulls no punches when getting to the jokes either, making them the best in the business at what they do. It would be a sin not to talk about the art involved in this publication. The first story - Dead Dog Dies - features some of the best ink I'm seen this side of anything. The style is both old school, but with a new school flair. It's heavy on the black lines, rich with shadow and texture, and amazingly eye catching. The dedication to detail in very appreciated, in that you actually pick up something new every time you glance at the panels. The rest of the book gives beautiful examples of how perfect the Old School (Kill, Baby, Kill) and the Newer School (Wickeder) comic styles are - when put together in one volume. This graphic novel, while short (clocking in at 64 pages), is a fun read designed for fans of both artistic styles, and anyone looking for a quick jolt to satify an itch. I urge you to check out Papercuts at their website. 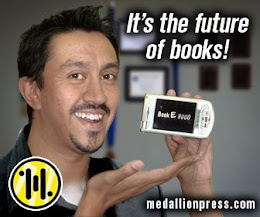 You can pick up their comics, graphic novels, and other fun stuff directly from them, at almost any bookseller (especially B&N), and online at Amazon.com. And keep an eye out for more parodies, including: Harry Potty and the Deathly Boring, Dielight (A parody of Twilight that had me in stitches - TFTC #8) and more. Hey--!! Thanks for such an enthusiastic and positive review of Tales From The Crypt, and our Papercutz Slices Parodies, such as Diary of a Stinky Dead Kid and recently-released hit, "Harry Potty and The Deathly Boring" as well as mentioning our upcoming Twilight parody....heh heh.... It's nice to know I'm not killing myself drawing these things just for the money.